Plans for the terminal were officially cancelled in May 2013. Balaclava Island is located approximately 40 kilometres north of Gladstone. In July 2008 Xstrata Coal announced that it would undertake a pre-feasibility study for a coal export port for up to 20 million tonnes of coal per annum. The study, the company stated, would be completed by June 30, 2009. By March 2010, the company referred to the proposal for a 35 million tonne per annum coal terminal. 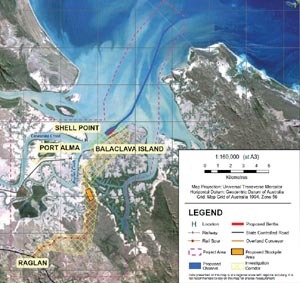 In a March 2010 newsletter the company stated that "in August 2008, XCQ commissioned consultants GHD to conduct environmental impact assessment studies to explore the viability for development of a proposed coal terminal in the vicinity of Port Alma. Following a range of desktop and field investigations, the project team determined that the most suitable location for the proposed coal terminal was on Balaclava Island. Subsequently, the project has been re-named as the Balaclava Island Coal Export Terminal Project." A new ship loading facility on Balaclava Island." Two weeks after the Glencore-Xstrata merger in early May 2013 it was announced that the company had stopped work on the proposed 35 million tonnes per annum Balaclava Island Coal Terminal. In a statement the company stated that "this decision has been made as a result of the poor current market conditions in the Australian coal industry, excess port capacity in Queensland, specific shipping limitations and concerns about the industry's medium-term outlook. The proposed terminal was one of the export terminals being investigated to cater for the Wandoan coal project. ↑ 1.0 1.1 Xstrta Coal, "Xstrata Coal commits to Port Alma pre-feasibility study", Media Release, July 2008. ↑ 2.0 2.1 "Xstrata Coal to seek community input for proposed coal export terminal at Balaclava Island", Media Release, March 22, 2010. ↑ "Balaclava Island Coal Export Terminal", Queensland Government Department of State Development, Infrastructure and Planning, accessed January 2015. ↑ Xstrata Coal, "Balaclava Island Coal Export Terminal Project Community Newsletter 2 (Formerly Port Alma Coal Export Terminal Project)", March 2010, page 1. ↑ "Glencore Xstrata to scrap plans for Australia coal export terminal", Reuters, May 13, 2013.